Arrival in Santiago de Chile. Enjoy a city tour including a trip up Cerro San Cristobal for a panoramic view at the city and its surroundings. The day is at leisure for own activities. Optional visit to beautiful Valparaiso, declared as a world heritage site by UNESCO, and the white beaches and picturesque gardens of Viña del Mar. Flight to Calama. Transfer to San Pedro de Atacama, the most important Archaeological centre in Chile situated 2,438 meters above sea level and surrounded by a green fertile oasis. City walk through the picturesque village and visit the beautiful white church of the town, with an inside construction of cacti. Right in time for the beautiful sunset, you will drive to visit the Valley of the Moon to see the sunset in this bizarre landscape. Full day excursion to visit the impressive sites of the Atacama desert like the Salar de Atacama, which is an inland sea dating back millions of years or the Lagoons Miscanti & Meñiques, set at the base of two immense volcanoes and the small Indian village of Toconao (seat-in). The day is at leisure for own activities. Optional excursion to visit the Geysers of El Tatio, situated at 14,760 feet above sea level in the Altiplano. Transfer to Calama airport and flight to Santiago. In the afternoon enjoy visiting a typical winery at Maipo valley. Wine tasting included. 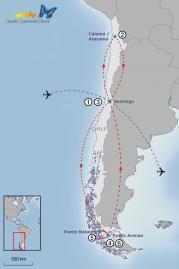 Flight to Punta Arenas in South Patagonia. Upon arrival half day city tour ending at the bus terminal. Drive by public bus to Puerto Natales. Full day visit to the Torres del Paine National Park (seat-in). The lagoons, lakes and isolated peaks make this park an unforgettable sight. The park is home to condor, puma, guanaco and Patagonian deer. Drive in public bus to Punta Arenas (without guide). Flight to Santiago. Remaining day at leisure.